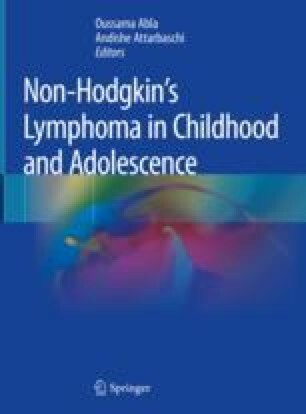 Non-Hodgkin’s lymphoma (NHL) results from malignant proliferation of lymphocytes and is generally restricted to lymphoid tissue such as lymph nodes, Peyer’s patches, and spleen. However, pediatric NHL can rarely and solely arise in other anatomical sites, such as the kidney, skin, lung, eye, bone, stomach, or cavities as an effusion. Adult-type lymphomas (chronic lymphocytic leukemia and multiple myeloma) have scarcely been reported in children. Understanding of these rare pediatric B-NHLs is mainly based on small pediatric case series or adult studies. Due to the limited number of cases the exact prevalence of the abovementioned NHL types cannot be easily estimated. Moreover, the index of suspicion is usually low because of the rarity, resulting sometimes in late diagnosis with a significant impact on prognosis. Since these NHL types are often more well-studied in adult population, adult-based therapeutic approaches are also applied in children. Prognosis in pediatric patients may be different from that of adults. So, more international collaborative efforts are needed in order to identify specific prognostic factors, including molecular and cytogenetic variables and define specific pediatric treatment protocols.